On Scene: Chimney Fire season, be prepared! Chimney Fire season, be prepared! Unfortunately, chimney fires are a real threat this time of year. According to csia.org, there are an average of 25,100 chimney fires, responsible for about 30 deaths, and over 126.1 million dollars in property damage a year. It's important that you have your chimney cleaned and inspected on a regular basis to avoid dealing with this serious and harmful occurrence. Here at TheFireStore we sell a Chimney Snuffer Kit that we believe every fire engine and apparatus should have ready and on hand to run up to the roof in the event of a chimney fire. This little kit is an easy to use, one-man job, that's heavy enough to break through the birds nests and buildup in chimneys, and let's out just enough water to put out the fire but not case damage to the cement and chimney structure. 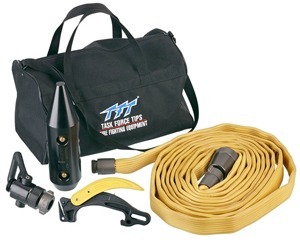 To grab one of these Chimney Snuffer Kits for your department, click here. Another great product we have which is on a deep discount right now is the Chimfex Fire Suppressant. At only $19.99, it's an amazing little product to keep on hand in the event of a chimney fire and to provide an immediate line of defense for controlling it. This is a great little tool that can be used at home, or just as a back-up or in-case-of-emergency event, to ease those worries! Be sure to read all about it, see the directions and product details here. Here's to a hopefully safer fireplace season!